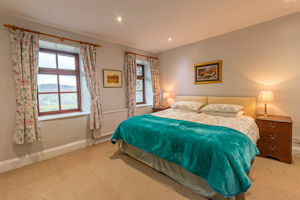 High Swinside’s prime hillside location gives the Farmhouse fabulous views down the Lorton valley. 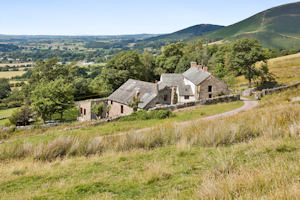 This cottage was part of the original farm where the Jennings brothers had their first brewery. It was built in 1741 and that date is burnt into the beam above the main front door. 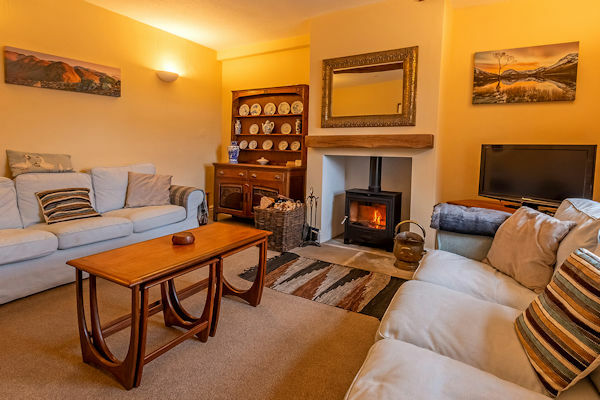 You'll find it a lovely rambling building with plenty of comfortable space for a group of friends or a large extended family. All the ceilings have oak beams - some with their original meat hooks! There are 4 bedrooms - one of them on the ground floor, and 3 bath or shower rooms. 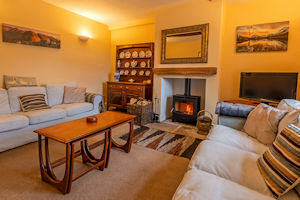 If you need more space the Farmhouse can be let with Little Swinside next door; the two are connected via a lockable door. 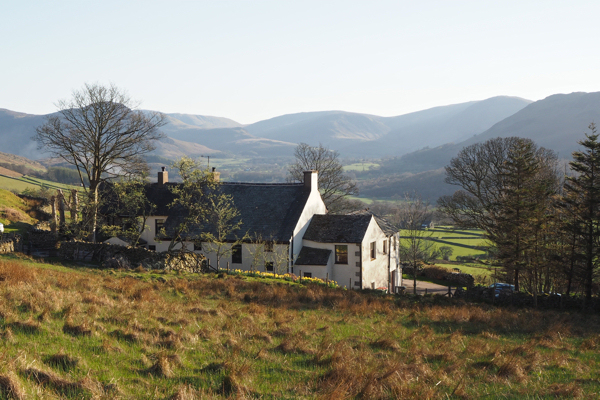 The Farmhouse makes an excellent base for wonderful walks at all levels and for challenging trails in Whinlatter Forest that put the "mountain" back into biking! See below for photos, information, and availability. 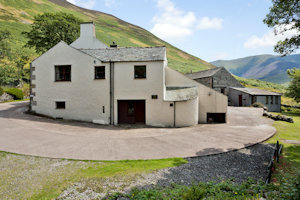 You enter High Swinside Farmhouse via an entrance hall with a long bench, boot racks and coat hooks. This leads into the dining area of the house. 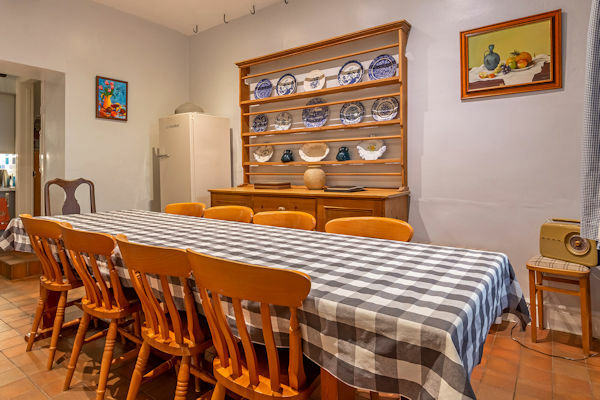 The dining area is open plan to the kitchen and both have a practical tiled floor. 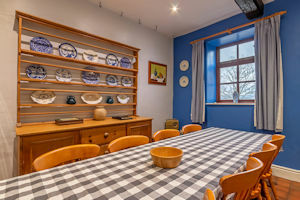 The long farmhouse table comfortably seats nine guests (and can seat up to 12 for groups/families who also book Little Swinside). There is a lovely pine dresser, and the old oak beams on the ceiling still have their original meat hooks. 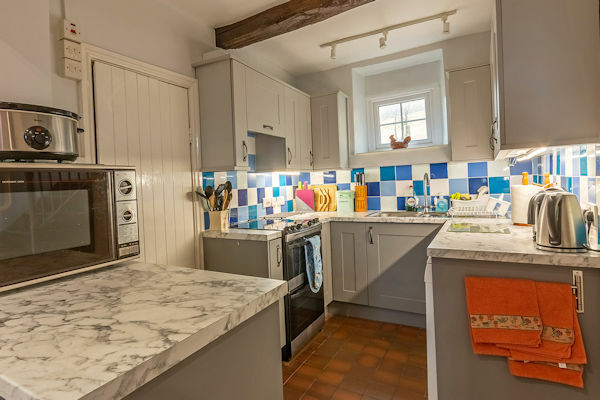 The kitchen is well-equipped with everything you would expect in such a good sized cottage: electric oven and hob, microwave, dishwasher, washing machine, fridge & freezer. 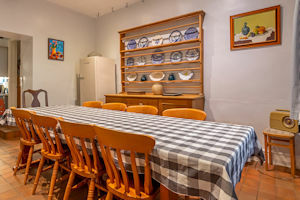 There are further laundry facilities in the basement including a tumble drier, and a large chest freezer that guests can also use. At the back of the Farmhouse beyond the track is a little raised walled garden - a sunny quiet space with daffodils in spring, and large clumps of colourful heather. Across the hall beyond the kitchen is the large sitting room with dresser, beamed ceiling, and lovely views across the valley. 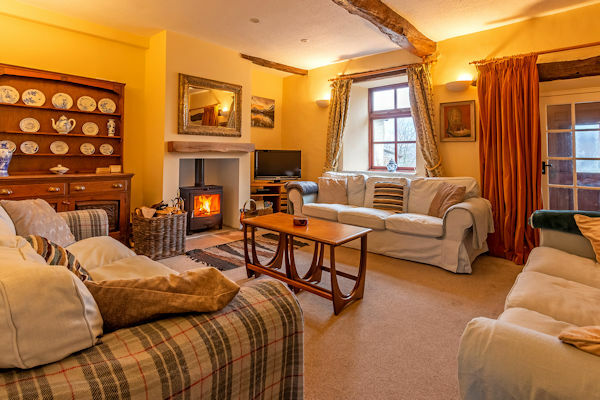 There are three big comfortable sofas - prefect for collapsing into after a day out in the open; these are arranged around the coffee table, log-burning stove, and a big basket of logs. There is a satelite tv/dvd and a dresser full of games & puzzles. The wifi is good throughout the cottage. 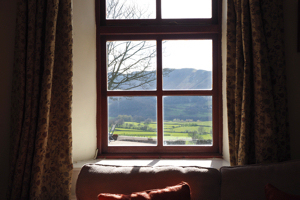 This is the view in winter from the sitting room window across the Lorton valley to Low Fell. Across the hall on the ground floor there is a downstairs twin bedroom. 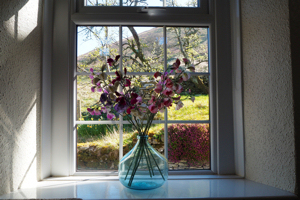 The window looks out onto the drive and towards the fellside behind the house. 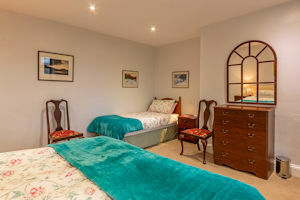 The bedroom has a large storage cupboard for clothes hanging (and is also handy for the ironing board and drying racks). Also on the ground floor just off the kitchen there is a shower room equipped with an electric shower. (NB. 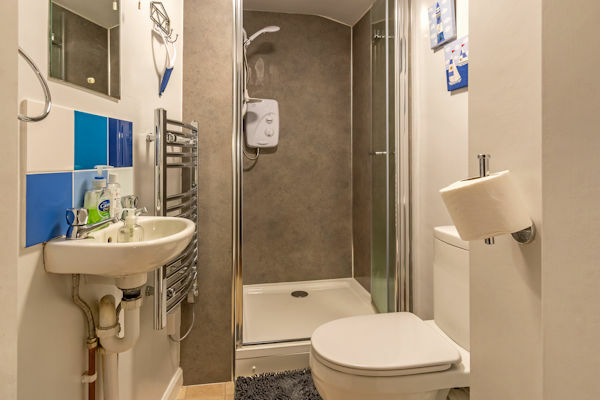 There are 2 steps between this shower room and the downstairs bedroom). Upstairs there are three more bedrooms all accessed from a central landing at the top of the stairs. 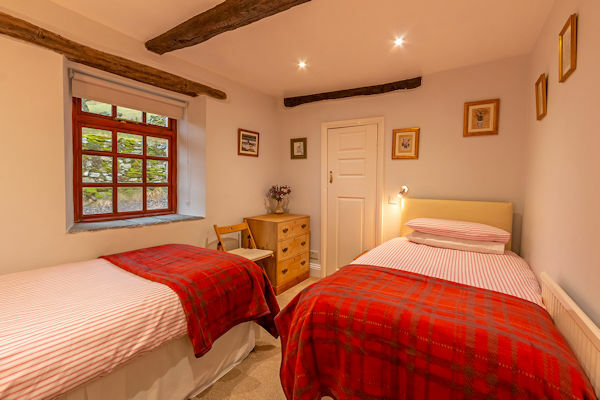 This pretty twin is truly a cottage bedroom with a small low window, quirky shaped walls, and a wonderful beamed ceiling! 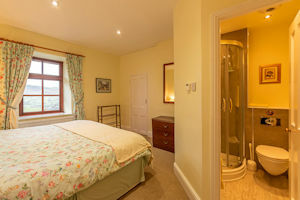 There is a good sized double bedroom with an ensuite shower room. The shower is electric. 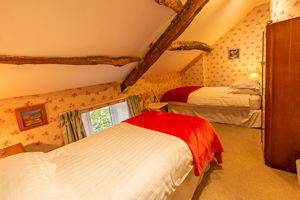 The double bedroom has a comfortable superking bed. This is one of two bedrooms at the front of the house with fine views out across the Lorton valley. 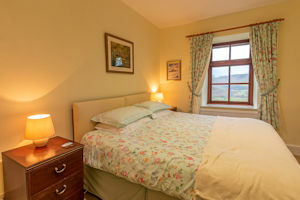 The 3rd upstairs bedroom is a large family room with a superking bed and a single. 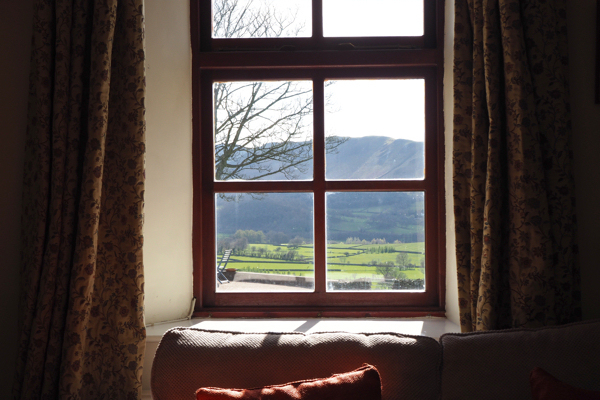 All the mattresses in the Farmhouse are pocket sprung giving good support and comfort. 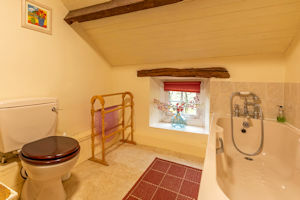 The family bathroom is also accessed from the upstairs landing. The bath has a hand-held shower attachment. A cupboard houses the electric immersion water heater. The garden is shared with the other cottages. It has a picnic table and benches for enjoying the view, and gated access to the open fells with wonderful walks on your doorstep. The garden also includes a secure fenced area where dogs are free to roam in safety. In the lower garden there are free range hens - and usually delicious eggs available. Through another gate an enclosed green lane leads in 20 minutes to Lorton village with its excellent village shop. The friendly dog-welcoming Wheatsheaf pub is 15 minutes further on and has an excellent menu (book ahead). 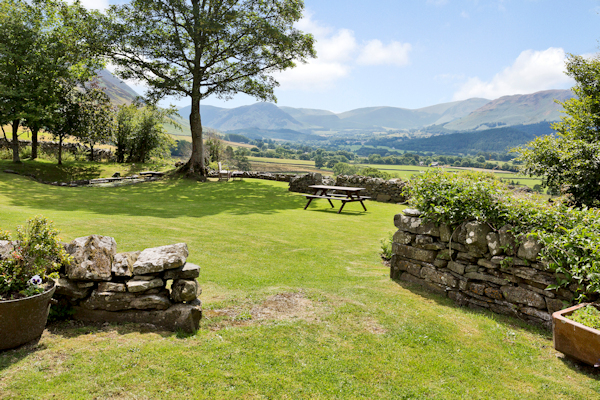 At the back of the property you walk out onto the open fells. Looking towards the north from the garden - or as here from the narrow gated road above the cottages - you will often see the Scottish mountains beyond the Solway Firth. View showing the position of High Swinside Cottages on the flank of Swinside fell. Beyond the cottages to the south east you can see Whiteside. There is a grand walk up to Whiteside and Hopegill Head from a short way along the lane behind the cottages, or you can make your way up onto the Grasmoor fells from straight outside your back door - via Swinside fell and Ladyside Pike. The Farmhouse has oil fired central heating and the water is heated by immersion heater (with two electric showers). 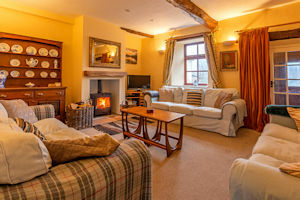 All heating and electricity is included in the price.